When you enter Frozen Bingo you’ll be greeted by icebergs, mountains and deep blue sea. Unfortunately, there’s no sign of sign of Olaf, Elsa or Anna which leads us to the conclusion that the site is based more on a wintery theme rather than Frozen the Disney movie. Once you get over the fact that this isn’t a Frozen branded site there’s a spectacular selection of bingo games, slots and mini games for you to enjoy while earning lots of extra cash with some fantastic promotion codes. Frozen Bingo offers all new customers 120 free bingo tickets which can be used to win your share of the £1,500 daily prize pool. To claim your free cards simply register an account and then make a small deposit of just £10. This welcome offer extends to your second and third deposits too, giving you 60 free cards on your second top up, and 30 free tickets on your third. You’ll also unlock 24 hours of no deposit bingo games from the minute you create an account. No card details are required, so this offer provides you with the perfect way of checking out the site completely risk-free. Deposit £10 and get 120 free bingo tickets. Penny bingo and free bingo games. Loyalty rewards & VIP programme. 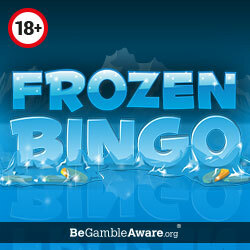 There are currently no promotion codes available at Frozen Bingo. However, make sure you check your emails as they sometimes send out one-off offers to keep you coming back for more. Stay cool on the go with this mobile friendly bingo site! There isn’t a mobile app but you can access the site from your smartphone or tablet by simply entering www.frozenbingo.com into your browser and signing in with your login details. It’s as easy as that! If you haven’t played at Frozen Bingo before you can even sign up via your mobile device and still claim your first deposit bonus. With so many great games to play at Frozen Bingo, this site is sure to send chills down your spine! There are three types of bingo you can play – 90 ball, 75 ball and 5 line. As well as regular games there’s progressive jackpot games, guaranteed jackpot games and free bingo so you can switch things up a little. The fun never stops at Frozenbingo.com! When you’re done playing bingo there is also a fantastic range of slots, mini games, scratchcards and table games for you to play. All your favourite slot games are here including Temple of Isis, Fluffy Favourites, Cleopatra, Sugar Train and Piggy Payout. There are also progressive slot games for you to try your luck on including Millionaire Genie where the sky really is the limit. 24 hours no deposit bingo. Get 120 free bingo tickets when you add £10. Good choice of games, including free bingo. No deposit deal isn’t as good as sister sites like Wish Bingo. Payment options available on this include are Neteller, Visa, Mastercard, Maestro, Solo and Paysafecard. It takes 48 hours to process withdrawals. Customer support email address: support@supportbingoonline.com. We would highly recommend checking out Frozen Bingo today as new players can take advantage of a great welcome package which includes 120 free bingo tickets when you add £10. Okay, so the site might not be based on the Disney movie as we first expected but that’s irrelevant in the grand scale of things when you have bonuses at every corner and a huge selection of games right at your fingertips. Our review says it all so join up today!